Fri., June 16, 2017, 5:17 p.m.
ARLINGTON, Texas – Pitchers shuttle between the Mariners and Triple-A Tacoma on an almost-daily basis. It happened again prior to Friday’s series opener against the Texas Rangers — although with a slight twist. The Mariners, as expected, optioned right-hander Chase De Jong to to the Rainiers one day after he pitched four innings in a loss at Minnesota. And for the usual reason: They wanted to have a fresh arm available as a long reliever. Enter lefty Zac Curtis, who returned for the second time this season not from Tacoma but from Double-A Arkansas, where he has a 2.66 ERA in 19 games. More important: He hasn’t pitched since Wednesday and is on the 40-man roster. 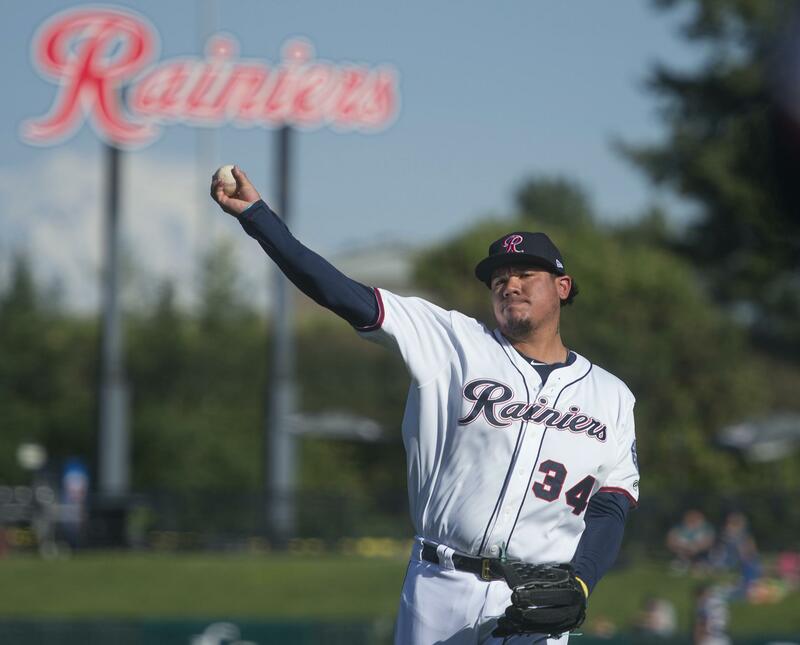 The Tacoma shuttle isn’t slowing down yet, but it will offer a different look over the next few days when Felix Hernandez and Hisashi Iwakuma, long-time mainstays in the big-league rotation, head to Cheney Stadium for rehab starts. Hernandez and Iwakuma could each return next week to active duty. The Rainiers should also get another short-term boost in shortstop Jean Segura, who is nearly recovered from a high right ankle sprain and likely to play a few rehab games to sharpen his timing before returning from the disabled list. Hernandez is slotted for six innings and 80-85 pitches Saturday against Salt Lake (Angels) at 7:05 p.m. It is the King’s third, and likely final, rehab start in his recovery from bursitis in his shoulder, which surfaced April 25 at Detroit. “The first (start) was not good,” pitching coach Mel Stottlemyre Jr. said. “Feeling for his delivery. Not knowing where his hand was. Not able to make pitches. Bad counts. Bad pitches. Iwakuma follows two days later (June 19), also against Salt Lake, in his second rehab start. He was diagnosed with inflammation his shoulder after a May 3 start against the Los Angeles Angels. Plans call for Iwakuma to throw roughly 70 pitches over five or six innings as a follow-up to his four shutout innings June 14 at Hi-A Modesto against San Jose (Giants). Drew Smyly is progressing, too. He threw his second bullpen workout Friday, an extended 40-pitch session, in his recovery from a flexor strain in his elbow that surfaced late in spring training. Smyly’s timetable roughly follows a typical spring-training format: three or four bullpen workouts and then two or three rounds of live batting practice before shifting to a simulated game prior to starting a rehab assignment. That schedule, barring setbacks, puts Smyly loosely on schedule to return after the All-Star break. Guillermo Heredia was the forgotten man in the Mariners’ outfield over the last few days when Minnesota started right-handed pitchers in three straight games. Manager Scott Servais vows that won’t continue. Playing time in the outfield is a premium commodity since Mitch Haniger returned last Sunday from the disabled list and reclaimed his job in right field after missing nearly seven weeks. Club officials view Haniger as a cornerstone of their future, and his performance to date, though still a small sample size, continues to validate that view. When Haniger suffered a strained right oblique muscle on April 25 in Detroit, the Mariners plugged in Ben Gamel, who quickly established himself as a lineup fixture. Gamel is batting .345, which would lead the American League if he had a few more plate appearances. He shifted to left field to accommodate Haniger’s return, which left Heredia and Jarrod Dyson to split time in center field. While Heredia has been a steady performer, Dyson is batting .323 over the last 20 games, ranks among the league leaders in defensive metrics and remains one of the game’s top impact players on the bases. Even so, Servais insists Heredia won’t be relegated to platoon duty solely against left-handed pitchers. Servais contends Haniger and Gamel each need down time despite their production. Servais pointed to another possibility: Gamel’s ongoing early work to become a viable first baseman. “The versatility is really big,” Servais said. “If eventually, Gamel can get a little first base in his game, then it really becomes a nice piece to have – to be able to move him around and be able to give Danny (Valencia) a day (off). Published: June 16, 2017, 5:17 p.m.